Atlas provides a comprehensive selection of weathering and light exposure instruments and services for the photovoltaic (PV), concentrated PV (CPV), and solar-thermal industries for testing both material and module durability. Over 30 years of testing and measurement experience supporting the solar industry. Atlas has been a pioneer in photovoltaic durability testing since the first photovoltaic panels for Skylab 1 were exposed in the custom SuperMAQ solar concentrating device at Atlas’ DSET Laboratories in the early 1970’s. In response to industry needs not being addressed with existing testing methods, Atlas introduced the first weathering durability-specific PV module testing program, Atlas 25+, in 2009, and a 4-track inverter reliability test program in 2013. Atlas specializes in PV durability at our Solar Test Center in our DSET Laboratories Arizona test site, and with large array grid-tied exposure capability at our Miami test site. Atlas actively supports and participates in major standards and testing initiatives, including the International Electrotechnical Commission (IEC), the Photovoltaic Quality Assurance Task Group (PVQAT), the SOPHIA European Research Infrastructures, and others. Atlas also partners with the U.S. National Institute for Standards and Technology to sponsor a series of biennial Atlas-NIST Workshops on Photovoltaic Materials Durability. Atlas xenon arc Weather-Ometers and Xenotest equipment are extensively by major manufacturers and government research labs such as the U.S. National Renewable Energy Laboratory, among others, for accelerated weathering tests of PV materials including backsheets and encapsulants, Other polymeric components such as junction boxes, polymeric topsheets, PV balance-of-system (BOS) components and alternative technologies such as Organic Photovoltaics (OPV) are also tested. For PV materials, “laminated mini-module” test specimens, and BOS component materials, most laboratory weather and solar durability testing is performed in Ci Series Weather-Ometers or flatbed SUNTEST XXL+ xenon arc lamp weathering instruments. Smaller material test coupons such as polymer backsheet and encapsulant materials can be tested in Xenotest instruments. Testing can also be performed at Atlas’ commercial laboratories in the US and Germany. Outdoor accelerated weathering of PV materials and mini-modules can be performed in any of the altazimuth solar tracking and concentrating Equatorial Mount with Mirrors for Acceleration (EMMA/EMMAQUA) suite of devices or the Atlas-NREL jointly developed Ultra Accelerated Weathering System (UAWS). Outdoor static testing of ground mount PV modules and BIPV products such as roofing and fenestration, are typically performed at Atlas’ Solar Test Center in Arizona or SFTS Miami test site. The Miami site is additionally equipped for testing grid-tied arrays. 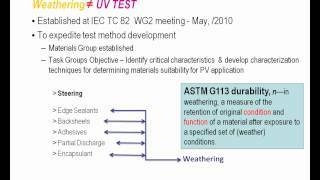 To supplement the IEC Design Type Qualification tests, Atlas created the first PV module comprehensive weather durability testing program, Atlas 25+. This program has continued to evolve to meet the needs of individual module and backsheet manufacturers and research institutions. A core element of Atlas 25+ is our large solar/environmental test chamber at our Arizona Solar Test Center. 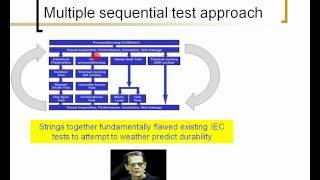 This provides realistic cyclic environmental testing under various climate conditions with modules operating under solar load.